Hey mommy! Look at what I drew on Steven when he was sleeping! "yeah, i want it to look exactly like hugh jackman..."
The tattoo artist did this one with their feet. They like a challenge. What was the thinking behind this...? If it wasn't so fucked up looking, this tattoo would be a win. 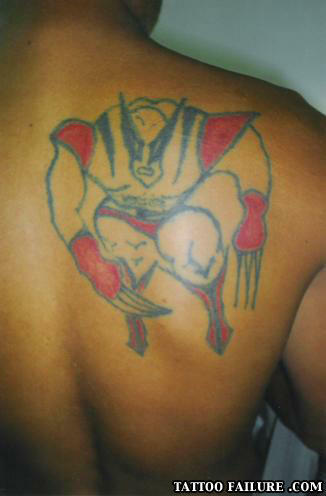 Why does someone tattoo Wolverine in his body? Wife: Do you know what the most untruthful lie I've told you?